This is our brand new health & fitness barbell set. It will prove to be a great addition to your home gym. This set of weights will enable you to keep your body fir and strong by enabling you to perform a variety of muscle building exercises. It's designed to develop you leg, hip and back power. With it you could do you gym any time you want. Don't hesitate to buy it! 2. 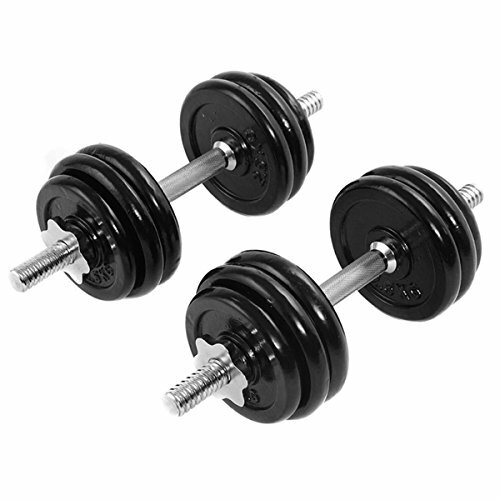 66 LB Dumbbell Set comes with weight plates set (1.5KG*4PCS,2.5KG*8PCS), Two rods and 4 buckles. Varying Weights ▶▷ Varying weights fits for all kinds of workout training session. Threaded ends with star-lock collars provide a safe, secure workout and easy weight plate changes. Diamond knurled chrome handle ▶▷ Set features ergonomic grips. Constructed of comfortable handles, textured chrome handle for secure, firm, and non-slip grip, help prevent your palms from shredding. Durable Constructions ▶▷ Made of high quality cast iron. Durable cast iron plates have a semi-gloss finish, premium grade, quality engineered and built to last. Suitable for basic toning and strength exercises. Humanistic Design ▶▷ Black painting surface increases durability, protects flooring, enhances appearance, is easy to clean and reduces noise. Exercising The Body▶▷ This workout set is sure to become an essential part of your routine for its weight variations and possible combinations. And it's easy to set and no tools required.